STEM steps into YOUR classroom! 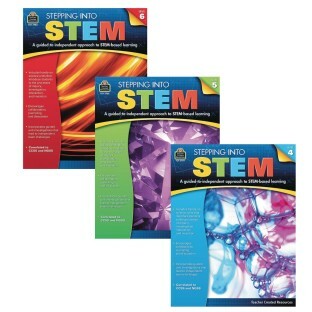 These dynamic resources provide guided lessons to integrate project-based learning into your science, technology, engineering, and math curriculum. Each unit provides background information for teachers and students and moves from teacher-directed activities toward more open-ended activities. The culminating activity in each unit allows students to design their own unique “invention” or conduct an experiment of their own creation. Students will be challenged to work collaboratively, using a design process that helps them “step into STEM” with greater competence and confidence. Correlated to CCSS and NGSS standards. 160 pages.